Huddleston Law Offices’ Business Formation Service includes all the documents you need when starting a business, while also saving you money. Don’t know what type of entity to form? Brian Huddleston can advise you there. Already know you need a Limited Liability Company? Fill out and return our LLC Worksheet to get started. Price Guarantee: We will match any advertised price on the internet for comparable services. Preliminary name check with the State in which you are forming your entity. Preparation and filing of formation documents. 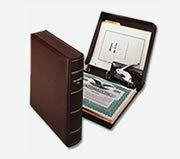 Corporate or LLC kit and seal. Stock or membership transfer ledger, for keeping accurate records of your corporation’s stock or LLC’s membership. Corporate bylaws or operating agreement, meeting minutes, waiver of notices, and resolutions. Tax ID (SS-4) form preparation. Corporate forms or LLC forms on disk. The turnaround time varies by state. Walk-through expedited service available for the State of Oklahoma. Free Registered Agent Service for one (1) year (Oklahoma Only). The total package is only $400.00, plus the applicable Secretary of State filing fee for your State (Click here for Oklahoma rates).